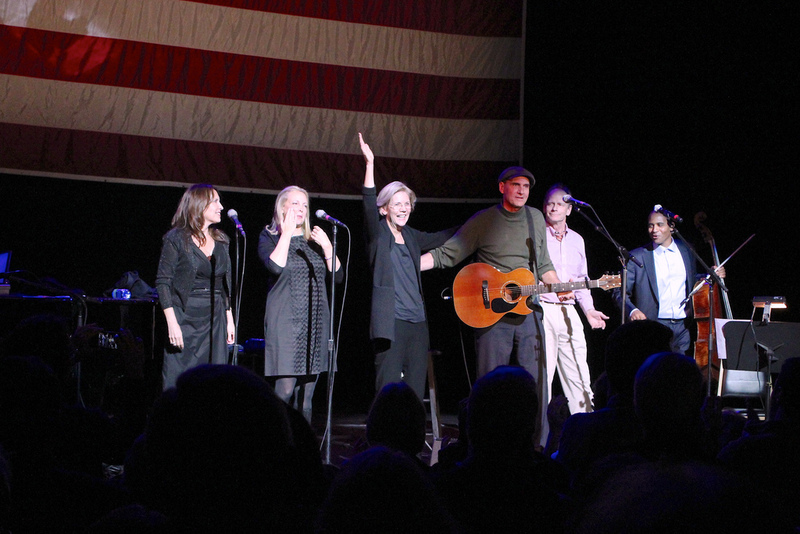 A crowd of more than 1,500 campaign supporters filled the Colonial Theater last night to hear James Taylor perform for Elizabeth Warren. Governor Deval Patrick took to the stage to rally the crowd before the music started. “We have to make a choice and our choice is Elizabeth Warren. For a better commonwealth and a better future, we are counting on you,” he told the crowd, encouraging them to get out the vote and work hard in these last days. Taylor spoke about his time on the road campaigning for President Obama and performed “Here Comes the Sun” as a reflection of his joy in 2008 when Obama was elected to bring an end to the Bush-Cheney years. Elizabeth came on stage at the end of the event, thanked Taylor, and thanked the audience for their hard work for the campaign. The evening came to a close with a standing ovation for both Taylor and Warren after they performed “America the Beautiful” to close out the event.